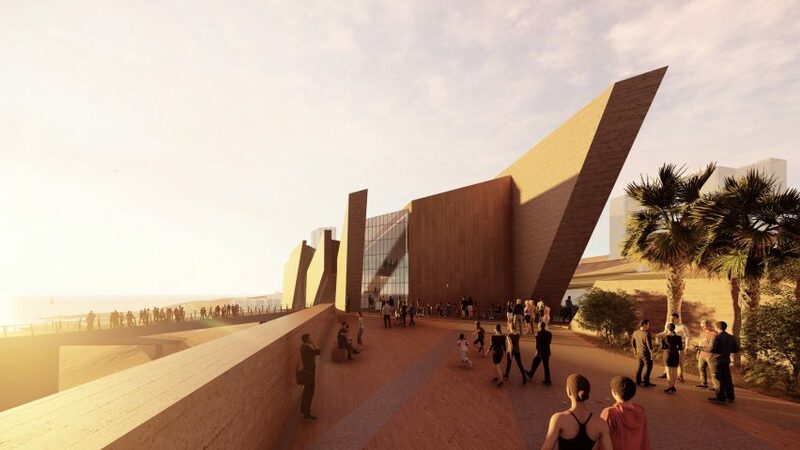 Studio Libeskind has designed the structure to replace the Museo Regional de Tarapacá (MAR) – which translates as Regional Museum of Iquique – in the northern Chilean port city. Comprising angular volumes and a red-toned concrete facade, the museum is designed to draw on the local landscapes, including the Atacama Desert. East of Iquique and one of the driest places in the world, the desert plateau covers 1,000 kilometres of land along the Pacific coast, with the Andes mountains further inland. 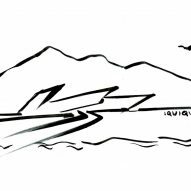 "The inspiration for the design entitled El Dragon de Tarapacá came from the stark landscape of the Atacama Desert, the giant cliffs and the urban dune of Iquique, the Cerro Dragon," said Studio Libeskind in a project statement. "Every volume references the surrounding landscape — dune, mountain, desert, ocean," studio founder Daniel Libeskind added. "The result is a silent musical composition in proportion, materiality, and light." Renderings of the structure show huge slanted walls that enclose a glazed volume. "It consists of three pairs of parallel vertical walls shaping the major spaces of the museum," said the studio. Locally sourced materials, such as earth-coloured concrete and hardwood timber flooring, are to be used in the construction of the museum to "reference the palette and textures of the surrounding natural landscape". Set to be built along the city's main boulevard, Avenida La Tirana, the 3,760-square-metre building will allow for a larger showcase of the existing Museo Regional de Tarapacá, which was completed in 1892 and is too small for the museum's vast collection. Displayed in the museum are notable archaeological remains discovered in Iquique's Cerro Esmeralda (Emerald Hill), a coastal mountain range of the Andes. Many artefacts are also from the Chinchorro, Pica, Tarapacá and Inca cultures. In Libeskind's scheme, these artefacts will be shown in exhibition spaces that span two levels and run along the length of the building. At one end, an area is proposed to feature a mirror wall to reflect the surrounding cliffs and dunes. Chile's new Museo Regional de Tarapacá is slated to break ground in early 2020. Meanwhile, in 2001, Libeskind's preference for leaning walls was presented in his design for the Serpentine Pavilion in London, at the city's Serpentine Gallery in Hyde Park. In July 2018, Studio Libeskind unveiled a museum in China, which is the firm's first project in the country.